1. Heat the oil in a frying pan and fry the chicken with the chorizo for 5 minutes until golden. Transfer to a large baking tray adding the tomatoes, red pepper and cannellini beans. 2. Roast at 200˚c, gas mark 6, for 20-25 minutes, stirring halfway. Meanwhile, cook the penne rigate in boiling water for 13 minutes then drain. 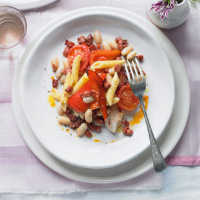 Serve the pasta topped with the chicken and chorizo mixture.